Recipients sit for a group photo with Gen. Jonathan Vance and Esprit de Corps founder Scott Taylor. 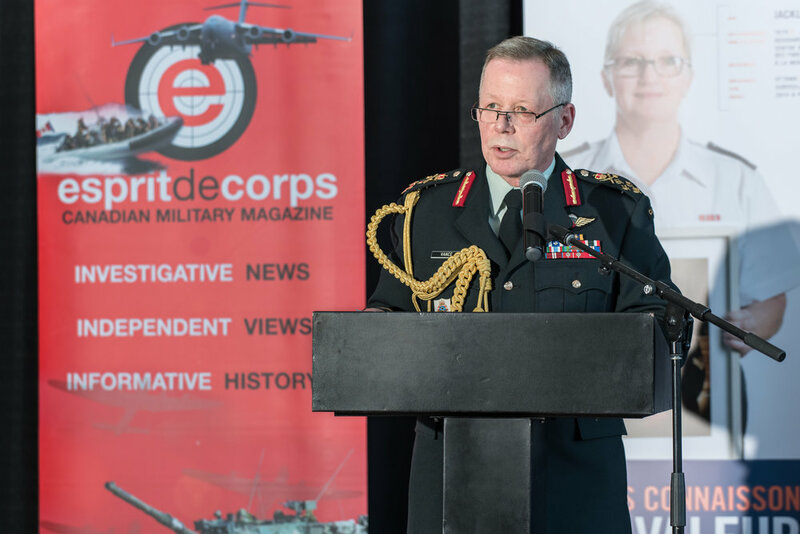 On Monday, April 9, Esprit de Corps magazine hosted a cocktail reception to honour this year’s winners of Esprit de Corp’s annual Top Women in Defence Awards. The venue was near capacity with over 400 attendees, including guest speakers Governor General Julie Payette, General Jonathan Vance (Chief of Defence Staff) and Major (Ret’d) Sandra Perron, Canada’s first female infantry officer. To kick off the night, twelve-year-old Mia Jovanovic serenaded the audience with the national anthem. Mia is the daughter of Biljana Jovanovic, who was a recipient in 2016. General Vance said he was delighted to be on hand to present an honourary plaque to each recipient. Mia Jovanovic sings the national anthem. “What you have accomplished makes you inspiring not just in the eyes of young women and girls, but also young men and boys,” he told recipients in a short speech. Governor General Julie Payette also made a speech, congratulating the winners on their contributions to the field of defence. “We are honouring you tonight, not for diversity but because you are good, because you are competent, and because you have done extraordinary things,” she said. Last, but not least, Major (Ret’d) Sandra Perron spoke to the crowd. “When I look at these recipients, I see beauty, grace, nobility, and softness (…) despite all the storms you’ve weathered because of what you are, what you represent,” she said. It was a night to remember for many, including several past recipients. One such guest was Jana Lee Murray, President of Women in Defence and Security (WIDs), who won the award in 2016. Recipients applaud the anthem and introductory remarks. Another 2016 recipient Major (Ret’d) Cindy Tessier was happily surprised to find that she shares connections with two of this year’s recipients. She not only nominated one of this year’s winners herself but was reunited with another winner who turned out to be an old friend from Basic Training, Lieutenant-Colonel Rebecca Sabourin. The two women joined the military in the same year and attended RMC together in the 90s. They had not crossed paths since until Esprit de Corps brought them together again on Monday night. LCol Sabourin now works as the Mission Support Chief for 1 Canadian Air Division Combined Air Operations Center (CAOC) in Winnipeg, Manitoba. “The award is a huge honour, I totally wasn’t expecting it,” she said. “I think it’s amazing to have an award that recognizes achievement and competence, especially when it’s for women,” said Sabourin. “It makes you feel like your achievement is a big deal, and it’s also a recognition of all the people throughout your career who have helped you get here,” she said. Gen. Jonathan Vance congratulates the 2018 Women in Defence award winners. Many people came together to make the night a success. We would like to thank the 15 embassies (Turkey, Serbia, Poland, Pakistan, Australia, U.S., China, Azerbaijan, Germany, Netherlands, France, South Korea, Chile, Russia, Kazakhstan) for contributing an exotic assortment of food and beverages to the reception, from baklava to Chinese whiskey. We would also like to thank the Commissionaires for their sponsorship and support, as well as the local musicians of the Ottawa Jazz Orchestra for providing entertainment. This year was the second time the magazine has held a formal event to celebrate the recipients. Esprit de Corp’s Women in Defence awards began in 2015 as a way of recognizing the positive impact so many women have had in what is largely considered a male-dominated field. The initiative continues to grow – in early years the magazine received between 30-40 nominations for recipients. This year Esprit de Corps received over 70 nominations for Top Women in Defence. The awards are presented to women who have made an outstanding contribution across the Canadian Defence sector. That includes regular and reserve personnel, veterans, cadets, defence industry, science, politics and media. Nominees are evaluated based on achievements, commitment and dedication to service, leadership, impact in breaking down the barricade/inspiring others through advocacy, and additional activities. 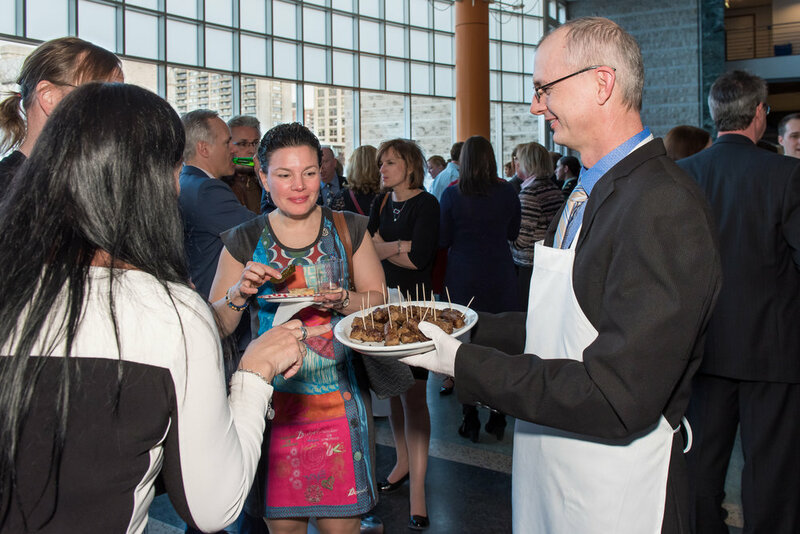 A volunteer server offers food to guests at the reception. If you would like to nominate an individual for consideration next year, the nomination deadline is January 15, 2019. Please include the candidate’s name, contact information as well as a brief outline describing their achievements in their field and any other pertinent information including, but not limited to, commitment to duty, role as a mentor or leader, community involvement, etc. to nominations@espritdecorps.ca.